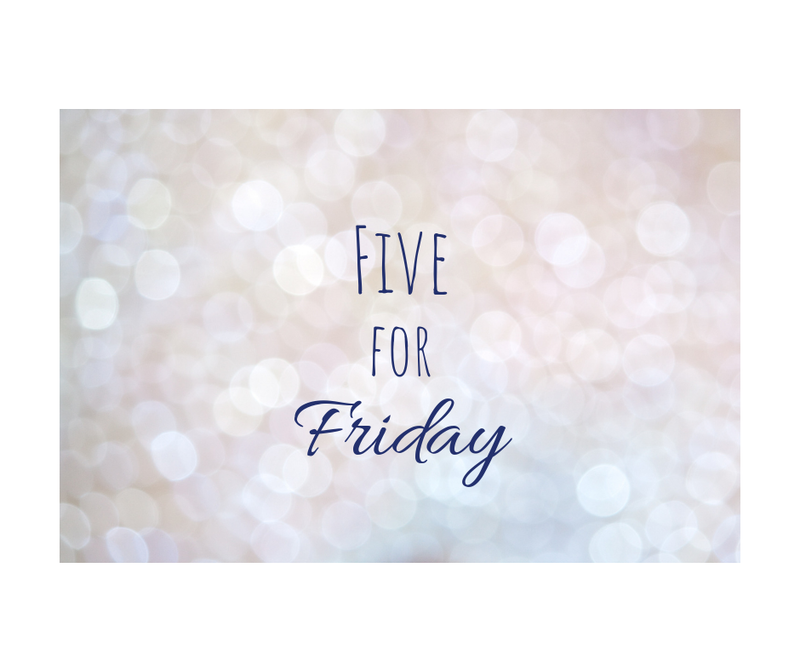 I've decided to change the title of these posts to Five for Friday. The name is as an ode to Five for Fighting -- I used to love his songs. (Little known fact that Five for Fighting isn't a group, but just one individual). Now his songs make me kind of sad, almost like they are too nostalgic, but they hold a special place in my heart! I just started reading The Wright Brothers by David McCullough and so far I'm loving it. This is the first of his books that I've read which is both surprising and embarrassing given how much I love history. I'm particularly loving this one because it takes place in my home city of Dayton, Ohio! The first few chapters have been describing life in Dayton in the early 1900s and I'm absolutely eating it up. I'll report back when I'm finished, but so far so good. I've learned a lot, like Wilbur and Orville had 3 siblings! Who knew? Have you read this one? Yesterday, I went to my first-ever estate sale and boy was it an experience. It was basically like a garage sale except everything in the house was on sale. If you're not familiar, they are usually held after someone passes away, or sometimes after a divorce or other life event. I ended up buying some dish towels and a brand new tea box. That, however, is not the point of my tale. So, there I was in the kitchen, looking through the cupboards that said "open me, good stuff inside!" 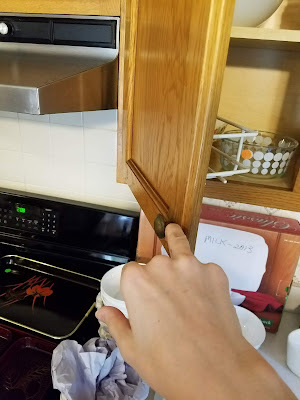 I opened one of of the cupboards with my right hand, when I would normally use my left, but I was holding Haddie and somehow my ring finger got stuck. Like, really stuck! I tried in vain for a good 5 minutes to pry it out, but there was no hope. Eventually I had to call to one of the women running the sale and a whole crew came over and ultimately used a screwdriver to remove the knob. One of the women exclaimed "this is certainly an estate sale first!" Mortifying. Then, as I was trying to check out, they told me I needed to download an app to pay. No problem, I say, and go to pull out my phone which is... missing. I knew that I had it in the house because I took the above photo. I searched everywhere I could think of and before I knew it, everyone in the house was looking for it-- the team working as well as other shoppers. We called it a million times and eventually someone found it in a washcloth drawer in the kitchen! I paid and hightailed it out of there in embarrassment. In my defense, I read an article about tips for your first estate sale(!) and one of them was to not bring your purse. I needed my phone in case I found something worth checking with Bill about. Every single other shopper in the house had a big ol' purse, so I won't be following that tip next time. I have spend most of my "free" time over the last week catching up on Grey's Anatomy. I watched this show religiously in it's heyday. In college, my friends and I would gather on Thursday nights to watch it together and I also owned all of the seasons on DVDs that I played nonstop, much to my roommates' chagrin. I lived for that show. Then when the "new" batch of interns (April, Jackson, etc) came on, I lost interest, plus I got tired of being sad every episode. A few years ago, I caught back up and then when Derek died I declared that I was officially done with Grey's. Well, as I mentioned awhile ago, I was attempting to watch all of ER, but it just made me miss Grey's so I decided to start back up where I left off and boy am I glad that I did! It's so good. I'm currently nearing the end of season 13 and it's seriously really good. I am so into it! I still don't like how sad some of the episodes are (anything involving babies or old people kills me) but nevertheless, I'm hooked. Do you still watch Grey's? We are headed home to Ohio to visit my family for a few days and then we are heading to Indiana to see Bill's grandma, and then back to Ohio for a few more days! It's going to be a whirlwind trip, but I am so looking forward to being back in the Midwest. There is truly nothing like fall in Ohio. We are planning to go to the pumpkin patch one day and I could not be more excited about that! In prep for our road trip, we bought Haddie's convertible car seat today! After a ton of research, we ended up going with the Graco Extend2Fit. Have you used this one? Do you like it? I went back and forth for a long time because we have been trying to use non-toxic products, which this is decidedly not. All car seats have flame retardants on them. There are a couple brands that use less toxic ones, but they are out of our budget. I also figured it's probably not any worse than the pack 'n play she's been sleeping in for months sooo I bought it. Other than that, it seems like a great car seat. I've read a lot of great reviews and it seems especially good for tall babies (up to 5 inches extra leg room!). It's also a slimmer-fit model of car seat which I'm hoping will give up some extra space in our car. For an SUV, it is surprisingly small inside. Disclosure: this post includes Amazon affiliate links - I earn from qualifying purchases. How embarrassing to get your finger stuck! I guess on the bright side, at least there was someone around to help you! Any time I've had something like that happen there's no one around!And have fun on your Midwest roadtrip! A pumpkin patch sounds fun! I haven't been to one of those in years. My family just relocated to Virginia, so I guess I will have to see if there is one around! Hope you have a great weekend! Where in VA? There are lots of good patches in Northern Virginia! So good! Luckily I got one weekend of real fall - the first weekend was literally 87 degrees but the next was in the 50s. Hi! 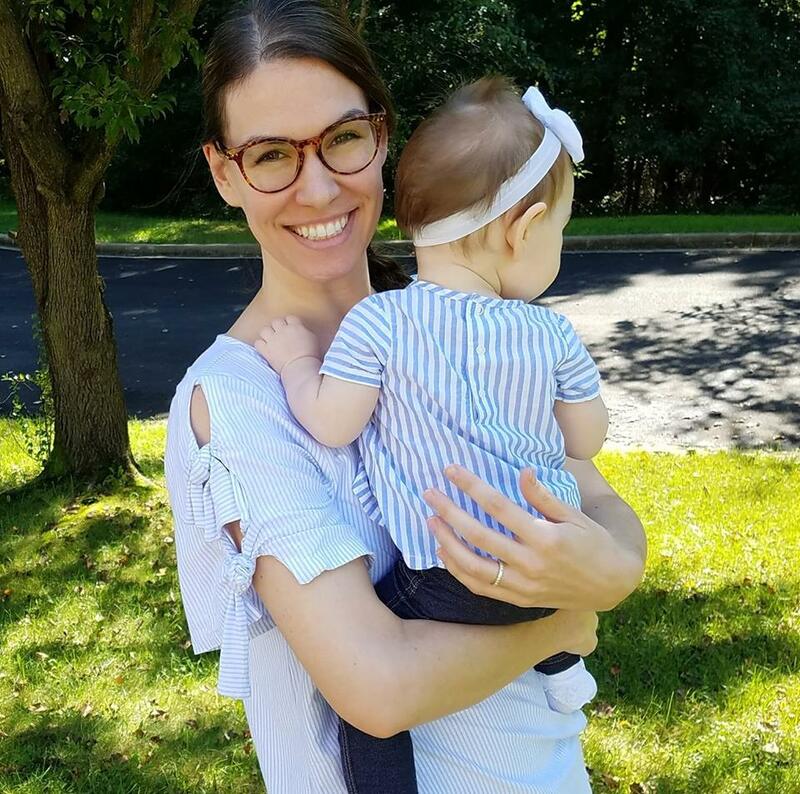 I'm Amanda and this is my blog. In it you'll find tales of motherhood, life in the DC area, cat stories, travel recaps, and more. Some links in this blog are affiliate links. I may earn a commission from products purchased via these links, including but not limited to Amazon links. As an Amazon Associate I earn from qualifying purchases. Opinions are my own.